QL went on tour in Jan. as part of VA Arts Festival's diverse programing they performed concerts, workshops and school assemblies on the East coast! (Nov. Update) ELM & Quinteo Latino's Partnership grew as the ELM students were guided to new levels of musicianship through two newly comissioned works: "Luna de Xelajú" & "Reggaeton Cruzeño"! (Oct. 3) Quinteto Latino kicked off our Residency at ELM today! 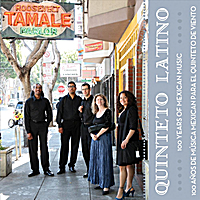 San Francisco based Quinteto Latino presents a captivating array of the music of contemporary Mexican composers. The playing is fresh, passionate, energetic and not to be missed.